The more than 1200 photographs from the Alaska-Yukon-Pacific Exposition document the fair held on the campus of the University of Washington during the summer of 1909. Images include depictions of the buildings, grounds, entertainment, and exotic attractions at the fair. When the World Came to Campus Library exhibit. 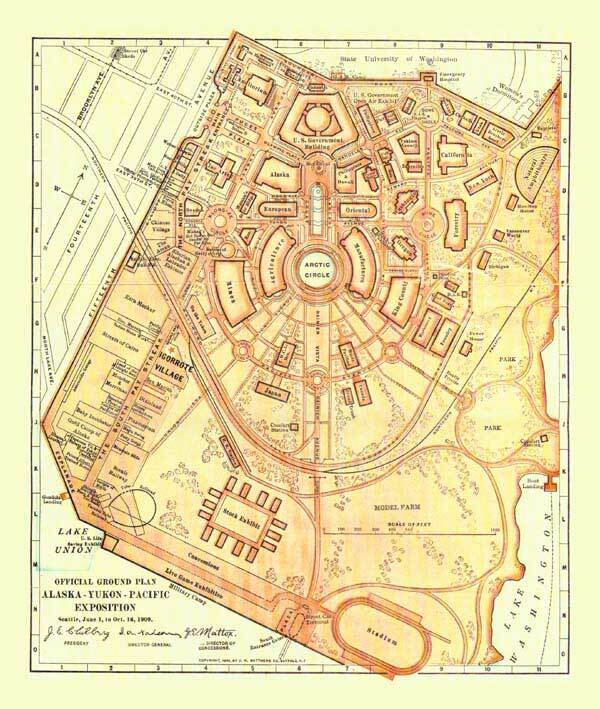 To view buildings using a map of the grounds click within the map image below. You can toggle between a map of the fairgrounds in 1909, during the exhibition, and a map of the fairgrounds today. The black line on the modern map denotes the extent of the fairgrounds. In the summer of 1909, a world's fair, the Alaska-Yukon-Pacific Exposition, took place on the grounds of the University of Washington. The fair shaped the campus in ways that are visible today, creating Rainier Vista and Drumheller Fountain. For many years, some of the former fair buildings were used by the University; today only Architecture Hall and Cunningham Hall remain. Landscaping for the fair was done by the famous firm of Olmsted Brothers, whose plan influenced all later designs for the campus. A succession of world's fairs took place in the United States following the tremendous popularity of the World's Columbian Exposition, held in Chicago in 1893. Local civic boosters successfully developed plans for such a fair in Seattle, intended to promote the region's economic and cultural ties to Alaska, the Canadian Northwest, and the Pacific Rim. The exposition opened on the grounds of the University of Washington on June 1, 1909. Frank H. Nowell moved to Seattle in 1903 after spending a number of years in Alaska, specifically Nome, where he operated a photography business. He subsequently spent 25 years on various commercial assignments including an appointment as the official photographer for the fair by J.E. Chilberg, President of the Alaska-Yukon-Pacific Exposition. His photographs were not only exhibited at the exposition, but displayed in official publications and souvenir booklets as well. His images and others document: the construction of buildings; fairgoers and the grounds; the "Pay Streak," the fair's entertainment area filled with amusement rides, restaurants and exotic attractions; special days commemorating groups such as fraternal organizations, occupations and nationalities; and state and county exhibits. Additional research materials about the fair such as brochures, postcards, maps, guidebooks, and scrapbooks can also be found in the Special Collections Division. The information for Alaska-Yukon-Pacific Exposition Collection was researched and prepared by the UW Libraries Special Collections Division and Cataloging staff in 1999. Not all the photographs from the collection were included in this database: the database consists of over 1200 digital images chosen from a larger group of photographic prints and postcards. The images were scanned in grayscale using a Microtek Scanmaker 9600L and saved in .jpg format. Some manipulation of the images was done to present the clearest possible digital image. The scanned images were then linked with descriptive data using the UW CONTENT program. The original collection resides in the UW Libraries Special Collections Division as the Alaska-Yukon-Pacific Exposition Collection.